and always the beauty of color clash. Even having DOUBLED the avaiable VRAM to store more color info. no MSX no nemesis, I DENY that the C64 is better. the same could be said for msx. Is there a decent version of GnG for msx or is doable? No. C64 had. and is good. But here we are arguing about personal ideas. however there is another story. in last minute the 9938 became double wide RAM for screen 7 screen 8.
but all the other modi and sprites did not get doubled the bandwidth. The MSX2 was what the MSX1 should have been, although the MSX1 would have been acceptable with scroll registers & a better sprite engine. I remember playing games on both MSX & C64 and I was always frustrated about the terrible scrolling of the MSX. "We" MSX-users might have gotten used to it, but the scrolling on MSX1-games was really, really ugly. I don't care what the reasons were for selecting this video chip, but it was wrong. Konami & others tried to make the best of it, but Salamander on the C64 played a whole lot better on the C64 then on the MSX in the '80s. The C64 also had way better, sound... but the MSX has a way more friendly basic, thanks to Microsoft. But, on the other hand? What are we complaining about, 30+ years down the road? It's not going the change anyway. 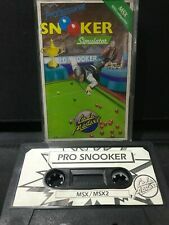 We all have great memories of playing games and creating stuff our MSX's. And we can still enjoy new stuff these days. Some great games have been released this year. It's better to focus on them, then on the mistakes made 30+ years ago. a C64 user would say "oh is that bitmap mode?" C64 cant use it in games. MSX and C64 are different beasts regarding... everything. Regarding graphics, C64 is more coarse and rough, but this allows things like this: https://www.youtube.com/watch?v=W-Crwct7U0c. In general, the C64 is more of a lumberjack who gets the wood chopped, while the MSX is more about delicate wood carving. MSX is slightly more high-res, which is good for Nemesis 2 'n such, but it doesn't scroll smoothly. Now have a peek at this: https://www.youtube.com/watch?v=riV6T0MLn-M. I wouldn't say that's bad actually... for MSX you get limited scrolling options if your game allowed to change tiles or tile definitions. It may just not always be possible, mostly not, I think. The SID is equally coarse and rough. Though I've heard things that outperform any PSG song. I think, however, that it's fair to say that, no matter how tiny the MSX definition of the standard is, we all have decent sound chips. Be it SCC, FM, OPL4 etc. Those are all more interesting than any SID, or any Amiga. Only downside is that we've had to endure moderate tools through the years. Maybe the MSX was indeed meant as a system to operate your household, all the VCRs, all the other stuff (which no one cares about). As a game and demo machine the C64 has the upper hand. All right, so even tinny SCC beats any C64 or Amiga. What? And then there's OPL4 from something like 1993, which has ... I don't know what that has to do with the MSX1 standard's unambitious and cheap low-risk component selection being a "stupid mistake" in 1983. Also don't forget the MP3 cartridge. The C64 didn't have an MP3 cartridge. things are confusing because MSX has a sucessor business, while C64 is one single thing. I’m happy the way it is . And yeah, SCC beats SID in my book . Quite different character to the sound, but I like the rich overtones. It’s also very powerful, capable of sample playback as seen in the Gradius mods, and still full of untapped potential, e.g. filters are possible, and it can do FM, all at relatively low CPU cost. I always wished MSX came with an SCC by default, to see what others besides Konami would’ve done with it. But yeah, custom chips was not among the design goals of the MSX1. Time to market would’ve been too great, by the time it would’ve been finished they would be years behind the other systems. 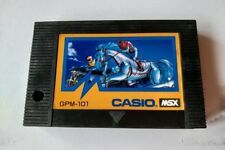 And yes, thanks to the extensible design, you can in fact thank the MSX1 creators for our OPL4, MP3 cartridges, etc. The MSX is really one of the most elaborate systems in terms of hardware support. Where else do you find so many sound chips, VDPs and other peripherals. It’s in the system’s DNA. Umh is only see a scroll demo and dirty pixels placed in column. I do not know how the demo manage sprites, how many are, if there is management for sprite/scanline issue, the amount of RAM needed, and most important, how the demo is taxing the cpu.